This page contains information about the history of JENBUL, and will be updated with new content regularly. The history of HAZOP and the history of JENBUL are intertwined. 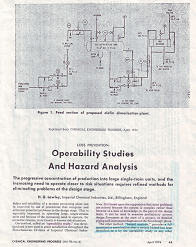 The first literature mention of HAZOP studies was in the paper, pictured right, by Dr HG Lawley in April 1974. 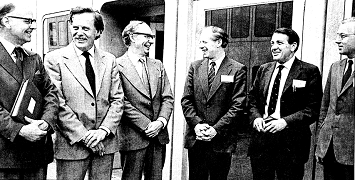 In July 1976, Lawley was involved with Teesside Polytechnic when they hosted a course on health and safety in the workplace. The other lecturers taking part, pictured below are (named left to right): Colin Bullock, Bert Lawley, Derek Jennings, Trevor Kletz, Bill Heafield and Basil Eddershaw. The team responsible for defining the HAZOP process and telling the world about it. Derek Jennings and Colin Bullock were the founders of JENBUL, which aimed to provide training for HAZOP to the world outside ICI.